Sausage tree | Infonet Biovision Home. 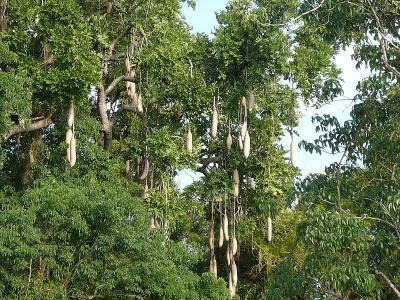 The sausage tree is native in Angola, Botswana, Burundi, Cameroon, Central African Republic, Chad, Congo, Cote d'Ivoire, Democratic Republic of Congo, Equatorial Guinea, Eritrea, Ethiopia, Gabon, Gambia, Ghana, Guinea, Liberia, Malawi, Mozambique, Namibia, Niger, Nigeria, Rwanda, Senegal, Somalia, South Africa, Sudan, Swaziland, Tanzania, Togo, Uganda, Zambia, Zanzibar and Zimbabwe in addition to Kenya. 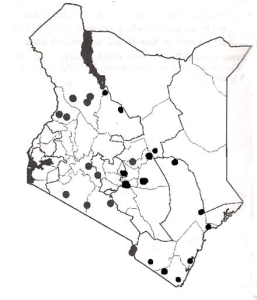 In the country it is distributed from the coast to the highlands in wooded grasslands, shrubland and riverine vegetation. Among the kikuyu community there is a traditional brew called muratina which is made fro this tree and honey. Its genus name comes from the Mozambican Bantu name, kigeli-keia, and its common English name Sausage Tree refers to the long, sausage-like fruit it bears. Its name in Afrikaans Worsboom also means Sausage Tree, and its Arabic name means "the father of kit bags" (Roodt 1992). Soil type: Peat, medium loam. Seedlings and direct sowing at site can be used to propagate it. K. africana is a relatively slow-growing tree; depending on the climate, it reaches good shade proportions in 4-5 years. The growth rate is about 1m/year but is slower in colder areas. It is not frost resistant, but if young plants are protected for the 1st 2 - 3 years from cold winds in colder areas, they will survive. Food: Ripe fruits are inedible, although slices of baked fruit are added to beer to aid in fermentation of local honey beer, for example throughout East Africa. In times of food shortage, the seeds are roasted in hot ashes and eaten. Fodder: When the flowers and leaves fall to the ground they are eaten by game and livestock. Apiculture: The large, maroon flowers attract bees and are a source of bee forage. Timber: The wood is easy to work and produces a good-quality timber for general use. Tannin or dyestuff: A black dye can be produced from the fruit. Tannin can be extracted from the roots and stem bark. Poison: extracts from the fruit have molluscicidal properties and raw fruits are poisonous to humans. Medicine: all parts of this tree are said to have medicinal value. Erosion control: The sausage tree is suitable for riverbank stabilization. Shade or shelter: it provides a good shade but should be avoided during fruition as its fruit which weigh about 12 kg are deadly if they fall on you. Ornamental: the tree is fast growing; its spreading canopy and interesting flowers and fruits, it makes a good ornamental tree. Other services: In Nigeria pieces of fruit soaked in water, together with small pieces of metal are sprinkled with young palm fronds to stimulate germination of yam tubers as well as promote a good harvest. Abbiw D. 1990. Useful plants of Ghana. Intermediate Technology Publications and the Royal Botanical Gardens, Kew.